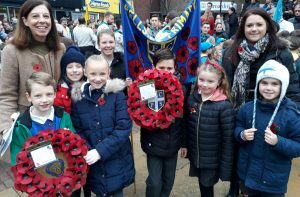 We are always honoured to take part in the Whickham Remembrance Day Parade, and this year was no exception. 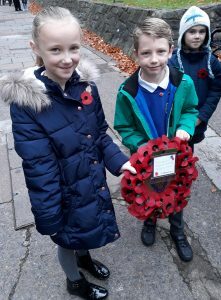 The children who represented our school were either members of our School Council and/or writers of the dedications to past and present military heroes which were penned by members of our Year 6 class especially for the occasion. One such writer, Year 6’s Lucy, had the added responsibility of reading out her dedication in front of a crowd that numbered many hundreds at this morning’s event. 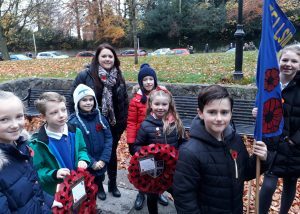 Mrs Thornber and I could not have been more proud of the children who represented Fellside, each of whom carried out their respective roles of reading, laying wreaths and processing with our school banner with incredible poise and respect as befitting such an event. Thank you to all of them. Scroll down past the pictures of the event (below) to read the dedications of remembrance written by some of our Year 6 class this year. Thank you for your sacrifices. It is because of you that we have enjoyed peace in our country and you give us hope for peace around the world. We salute your honour and offer you our respect and admiration for all you have done for us. Today we wear our poppies with great pride and remember that they symbolise your courage. Thank you for your selflessness. You have given so much to us, sometimes making the ultimate sacrifice so we can live in peace. Your bravery has left an indelible impact on us all and we respect your honour today, wearing our poppies with the utmost pride and admiration. May you return to us safely. We honour you as you have honoured Britain, today above all days. We remember you for putting down your lives for us, often with great personal consequence. To every serviceman and woman, we offer you our gratitude. We salute your selflessness in protecting our country from harm. We thank you, courageous servicemen and women, for enabling us to grow up in freedom and in a place of safety. We thank you for your sacrifice now in trying to ensure that is the case for other countries around the world. We remember you with the symbol of the poppy, a resilient flower that grew in Flanders and that we now wear with pride, honour and respect for all you have done for us. Some lovely remembrance dedications. 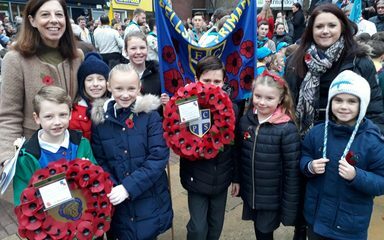 Well done to those children who represented Fellside School at the parade.